This entry includes a video demonstration of a homemade tornado ball.Â This version is different from many homemade models however, as the ball itself is also homemade.Â Many homemade tornado balls include just the outer shell (not the actual ball). Below is a link to a brief PDF that I wrote several years ago (2003) regarding homemade tornado ball options. The ball seen below actually has the same basketball net from many years ago (seen within PDF file). The difference is that I’ve now encased the net in a Gorilla Tape.Â I used an entire roll of tape for added protection.Â The tape makes this a permanent device.Â The ball can no longer be removed. I opted for a permanent device as I really wanted to protect the outer shell. 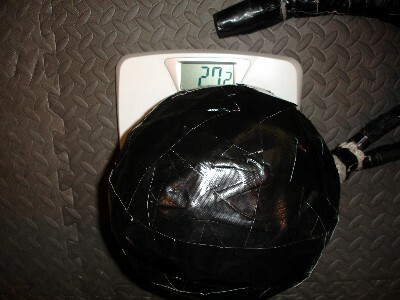 As you can see, this homemade ball is 27.2 pounds.Â This is much heavier than most commercial models.Â With the added weight, you really need a strong outer layer to protect the ball. I then added tape around the basketball.Â This was done initially to overcome the slickness of what had become a worn down homemade medicine ball.Â The original basketball had been used for a long time so the outer grip had become somewhat slick.Â I first covered the ball in Gorilla Tape and then added a layer of athletic tape as a more grip-friendly surface.Â You can see this white athletic tape in the first picture above. The tornado ball handle is an old pants leg that has been wrapped around a piece of pipe foam insulation.Â The pipe foam added to the thickness of the handle.Â I then wrapped the entire handle in Gorilla Tape.Â A rope could also be used for the handle (and is obviously more convenient).Â I just happened to have the old handle from several years ago so made use of it. Why Bother With Homemade Options? I had a few other medicine balls available, so decided to convert the old ball into a heavy (permanent) tornado ball. Most commercial medicine balls are quite expensive.Â When you add a rope to the ball, the price jumps even higher. With a quick search on Google, I found a 15 pound ball + rope for over $150. I prefer my homemade 27 pound model for several reasons.Â Clearly, my ball cost a fraction of this price.Â Â A 50 pound bag of sand is only a few dollars.Â The added weight is also useful when focusing on pure power (although lighter balls can be useful for other exercises).Â Perhaps the greatest benefit in my opinion is the non-bounding nature of the homemade ball.Â You can smash this ball as hard as humanly possible with minimal rebound at the bottom.Â This means swinging without fear of a bounding ball bouncing back into your face.Â Bounding medicine balls are not useful for slam/smash drills as it is natural to let up at the bottom to avoid being hit in face. 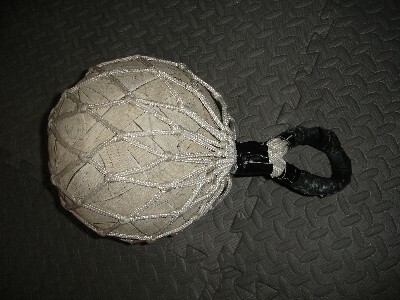 With a non-bounding homemade version, you can swing as hard as possible.Â This tool also comes in handy for those who would like to swing a heavy sledgehammer but do not have anywhere to use it.Â The tornado ball can be used on almost any gym floor.Â A matted surface is recommended if possible however (to avoid damaging the ball and/or floor). If you already have a sledgehammer, you may be wondering if it is worth using a tornado ball.Â The two tools certainly appear similar, but each does have a unique feel. The tornado ball can also be used for several other exercises.Â Simply type “tornado ball” into the Youtube search engine and you’ll find several rotational exercises that would not be possible with the sledge (Youtube Tornado Ball). I also bring the tornado ball with me when training at other gyms that do not have tires for our sledgehammers.Â The tornado ball becomes a portable sledgehammer that can be used almost anywhere. In addition, the tornado ball is useful to those who cannot find a sledgehammer that is greater than 16 pounds.Â Many hardware stores (ex. Home Depot) only sell up to 16 pound hammers.Â If you wanted to go heavier, the tornado ball is one option. In summary, I find both tools useful.Â We make regular use of the sledgehammer and tornado ball. Here is a video demo of the downward slam. You can smash that into a sandbag instead of that cushion, too. I once misplaced my non-bouncing medicine ball, and only had the bouncy one. 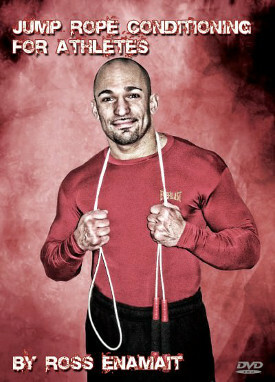 A sandbag was the way I found that I could do my slams without damaging the face. Many of my sandbags are filled with pea gravel, mini marble chips, etc. however so I don’t wish to smash the tornado ball into these bags. The matted floor works well. We also have a very large mat (must be around 6 inches thick) at the boxing gym that does a great job of absorbing each slam. what’s the name of the song in it? Is anyone else reminded of that last battle scene in Conan? That is sick.I am always looking for off the wall methods to improve and enhance my training and I will definitely try and incorporate this into my workouts. Thanks for a really good idea. Great one, I will use this for sure. Thank you. so how do you make the ball 27lb? basketball doesn’t weight that much. Am I missing a link here? notice a lot of peopel are talking about waht to slam the ball into. just wondering if anyone would recommend a type of floor mat i could leave down at all times as to not damage my floor with these exercises or dropping weights. i also noticed most “high intensity foams” are about 2-3″ thick at most, does anyone have a DIY ideal for 6″ padding without brekaing the bank? any ideas would help. my email is aequitasmgmnt@gmail.com, but im sure ill check back here often. I just made one of these today. mine weighs about 22 pounds. There are lots of shoulder and core workouts you can do with this ball. Pretty easy to make too. You can buy a blue camp foam mat from wally world for like 9 bucks. cut it in half and you have a nice 2.5 inch or so thick mat to bounce your balls on. Hi Ross, nice alternative to sledgehammer ! But I have a question, why do you need to have a little break after rebound (reload in the video) ? You don’t do it whith the sledgehammer so the pace sounds more intense!! @William – This was just a quick demo from 2009. You can work faster, but it’s useful to reset quickly when using a large ball. If not, the ball will begin to swing and smash into the legs. The sledge is different as it doesn’t bend. The tornado ball has mind of its own. Thanks very much for your answer ! Let me try this very soon and thanks again for motivation and inspiration ! Best site on the net !! !